Q: How to boost my computer? 1. Click "SCAN" to view all items to be boosted. 2. 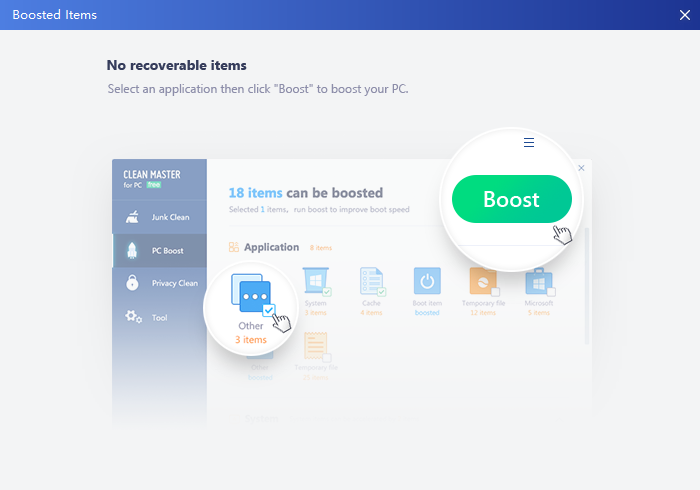 At "PC Boost" interface, click the title of each category to see item lists. You can boost items that we've automatically selected for you, you can also make your own selection. If you don't want an item to be shown or boosted, click "Details" right below its icon and then click "Ignore" or "Ignore All" in the pop-up window. If you want to view or boost ignored items, you can click "Ignored" in the lower right corner. 3. Click "Boost" after you've selected items to be boosted.